Weeds ordered over the internet are a growing international biosecurity risk, and in New Zealand (NZ) they are increasingly detecting post-border incursions. Traffic volume is expanding, and plants are arriving faster than ever before. New plants in NZ need a risk assessment clearance under the Hazardous Substances and New Organisms Act 1996 prior to importation, with plants already in NZ subject to relevant Import Health Standards. The countries of origin are also required to certify that material conforms to NZ import requirements, and are free of visually-detectable regulated pests. NZ biosecurity authorities have a non-statutory “National Pest Plant Accord” (NPPA) with the Nursery and Garden Industry, and NPPA-listed plants cannot be sold, propagated or distributed in the country. Purchases over the internet by-pass this accord increasing the risk of naturalisation of both plants and their associated pests (Pearson & Hill 2014). Across the ditch, in Australia, it is a similar story. The Invasive Species Council of Australia recently tested how easy it is to buy prohibited weeds online, and found quarantine seriously wanting. Purchasing mexican feathergrass (Nasella tenuissima) seeds over eBay was relatively quick and simple, and proceeded with no warnings about the potential risk of bringing prohibited seeds into Australia. Within about a week the seeds arrived. One hundred seeds of mexican feathergrass were received in the mail from New York and one hundred thousand seeds from Hong Kong (Cox 2014). In NZ in 2013, 4.1 per cent of all post-border investigations were internet purchases, mostly seeds. NZ quarantine selects international mail for inspection using intelligence, x-ray image analysis and detector dogs. Over the last five years mail arrivals have dropped by 18 per cent, but the express freight incursion pathway has increased by 9.5 per cent. Consignment declarations are sometimes deliberately misleading to avoid inspection, and some domain names sound local (e.g. flowerseeds.co.nz) but ship directly from overseas (Pearson & Hill 2014). The Australian example shows this to be true. One of the mexican feathergrass packages received by the Invasive Species Council listed the contents as “Gift: Plastic beads 1 pack” (Cox 2014). Complaints to internet suppliers, particulaly eBay, are very difficult. There is often no obvious way to reach the seller if there is a problem and the complaint links are often ineffective. When the ACT Government complained to internet suppliers over a number of months, their complaints were ignored. 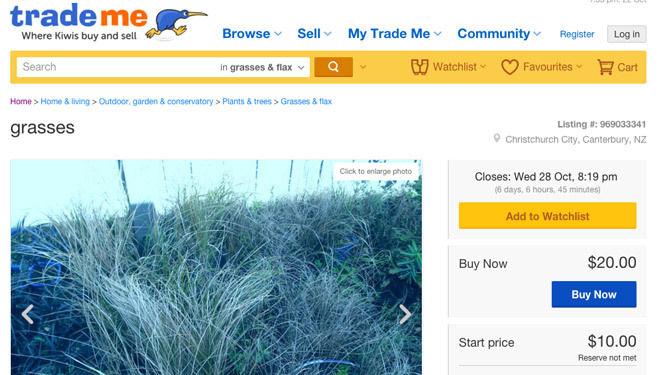 Not long after their complaints, in 2009, Bunnings and Big W were caught selling hundreds of mexican feathergrass plants. A national recall was issued and the companies were fined. 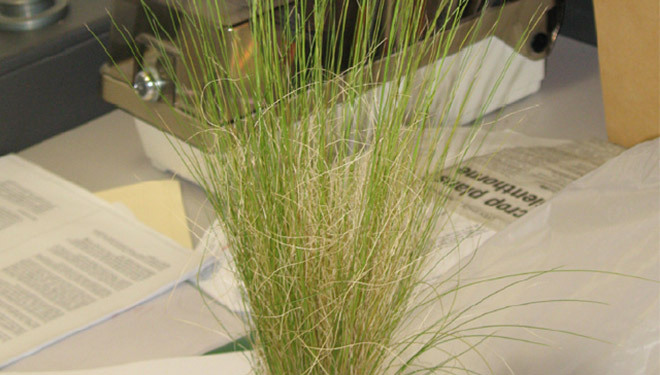 Sometime later the ACT government found ten mexican feathergrass plants growing on a Canberra property with the windblown seeds piled over a metre high and half a metre thick against a house door. 10cm of topsoil had to be removed as part of the eradication effort and five years later, seedlings are still being removed during annual checks (Cox 2014). Illegal internet sales are recognised as a growing biosecurity threat (Cox 2014). Education of both e-commerce traders and buyers is needed to reduce this threat (Pearson & Hill 2014). Internet trading platforms such as eBay should prevent traders from selling prohibited species and improve their complaint mechanisms (Cox 2014). The Ministry of Primary Industries (MPI) NZ has developed good cooperation from NZ’s largest on-line trading site, “Trade Me”, in removing illegal listings, but systematic monitoring of sites is also required, along with effective self-regulation of on-line sites (Pearson & Hill 2014). In Australia, when it was revealed to the biosecurity inquiry the ease of online purchases of prohibited seeds, the jaws of the senators dropped. The NSW rural newspaper “The Land” ran a front-page story in November 2014 about The Invasive Species Councils online seed ordering experience and officials started to take notice (Cox 2014). Since then, the Department of Agriculture has requested eBay to stop Australia being a destination for particular traders and eBay have improved their procedures. The Department of Agriculture have also tried to contact sellers using other platforms, not entirely with success. The Australian Government Department of Agriculture needs to determine the nature and extent of online illegal sales and to develop a compliance strategy (Cox 2014). In 2012, the International Plant Protection Convention (IPPC) advocated an international response and NZ is currently collaborating with the USA, with interest also from Canadian and South African biosecurity authorities (Pearson & Hill 2014). The community can play a valuable role in preventing online weed incursions by reporting suspected illegal sellers to biosecurity authorities and complaining to website trading sites. To facilitate this work the Invasive Species Council has set up Border Patrol Eyes Online, an online spotters network to help close down trade in dangerous new weeds and animals. All you have to do is sign up as a ‘Border Patrol Officer’ and undertake to regularly monitor online sales of particular prohibited species. Get involved at: http://invasives.org.au/project/border-patrol-need-eyes-online/ (Invasive Species Council 2014). Note: the seeds purchased by the Invasive Species Council have since been safely destroyed to ensure they no longer pose a risk, and authorities have been notified (Cox 2014).